Any Commercial Business Strategy must ensure that the initial research and market audit and analysis runs alongside the basic elements of new product development in order to conduct the research required and begin to understand the market(s) that you will want to sell your products / services / solutions into. It means conducting a SWOT analysis for each new ‘Product / Service’ area that you are looking to develop in order to better understand the status of your position as it currently stands – and provide an indication of your Strengths, Weaknesses, Opportunities and Threats, which in turn will help to determine whether there is a realistic business opportunity here for each particular product / service. From this, you will then be in a better position to see where improvements need to be made or change needs to happen in areas of product development and what needs to be understood more clearly to allow this to happen, and what should you be able to capitalise on to gain a foothold in the market, and then over time increase your market share. 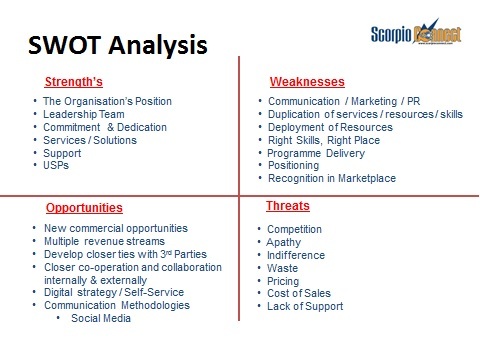 This slide depicts a sample SWOT analysis – which will undoubtedly change in the detailed business plan as your commercial business direction becomes more formalised. As with any commercial ambition, there needs to be a full assessment of the likely market potential for any of your products and services in order to fundamentally establish the size and scope of the various market sectors that you wish to approach. This is to establish who your prospective customers could be, what they might need (and in particular what they can’t find anywhere else). More importantly… do they have a budget and will they spend it to acquire a product or service from you? And key to this is establishing whether there are indeed realistic sales opportunities for your potential products and services before you extend time, effort and money is developing something for which there is no market for. Clarifying what their particular needs and requirements actually are – not so much what they would like, but what they actually need and cannot find elsewhere. What are their overall business needs and business requirements? What reason would they have to buy something from you? Is this to do with features, benefits, added value, service, price, availability or something else? Who’s involved in the overall evaluation / decision / buying process? Who are the users, the influencers, the decision makers, the financial buyers? Have you met and assessed everyone on this list? What is their overall decision process? What’s their decision criteria? What must be fulfilled in order for them to make a decision? What do they want, that others cannot provide but you can (or could) – and which will also help you to formulate your USP’s? In conjunction with who your prospective customers might be, a detailed competitor analysis will need to be undertaken in order to establish who is already present in this market space with similar products and services – so that you can begin the process of understanding what you would need to develop in order to be competitive, which in turn will help to establish your own marketing messages, your key differentiators and USP’s and other elements such as pricing etc. Also it’s about having that range and diversity of products and services and how you can offer a prospective customer something suitable that will not only meet their particular needs but also fit their budget. This way your efforts will remain focused and prioritised.